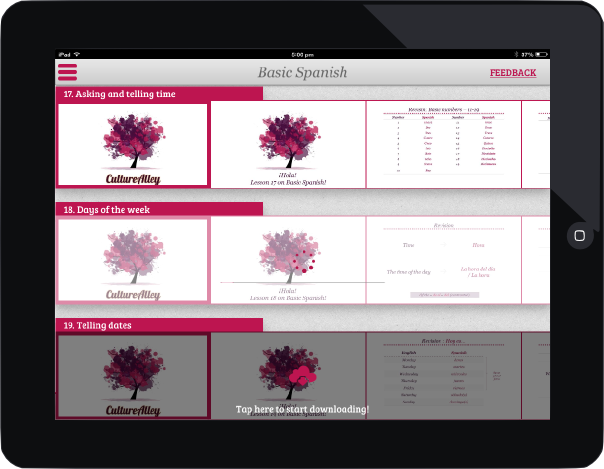 CultureAlley Spanish App for the iPad – What do the lessons cover? Wish someone would explain you the logic behind Spanish conversations? Wish you wouldn’t have to deal with 1000s of flashcards? Been learning Spanish but still feel you cannot talk to a native? Stop mugging up Spanish! Start conversing! Say ¡Hola! to the simplest and the most logical way to learn Spanish. The first leg of the voyage will get you rocking on the most essential conversations in Spanish. You will master Spanish greetings, and will be able to introduce yourself in Spanish, ask for introductions, communicate about the languages you speak, and about your understanding of the new language. Leg 3 gets you all set to have advanced conversations. Travel to Spanish speaking countries, ask for directions, communicate in emergency situations, describe people, discuss hobbies, and more! It also gives you a dose of some essential Spanish grammar to help you frame your own conversations! You will learn how to compare and grade things, and learn more about essential concepts like gender and singular-plural, to give you the confidence to rock Spanish like a native! So what are you waiting for? Kick-off your Spanish voyage, today! The CultureAlley Spanish App for the iPad is available for free download on the App Store. See you at the Alley!